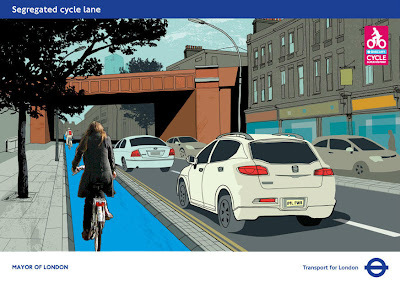 Cycle Super Highway 2 Extension visualisation. Transport for London earlier this week confirmed the launch dates of two new Cycle Super Highways later this year. The first of this is Cycle Super Highway 2 Extension (or CS2x as it is now known) to Stratford and Cycle Super Highway 5 between Victoria and New Cross. First things first: CS2x is targeted to launch in August and CS5 in October 2013. Construction of both should start in just over a month. The Transport for London document came to light thanks to an announcement that the cycle highways will be built by the London Highways Alliance. First of these is very welcome indeed. Vauxhall Bridge is likely to feature new two metre-wide bike lanes in both directions (as the result of one bus lane being removed). 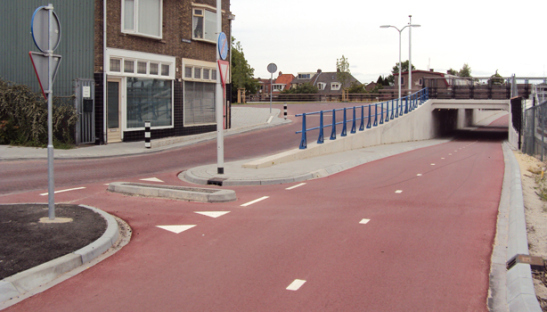 Either end of the Bridge will feature a "dedicated green light phase to allow cyclists to wait ahead of other traffic before crossing the junction". This sounds much more constructive some of the previous plans. Cycling at Vauxhall as it looks now. CS5 was originally intended to run north from Vauxhall Bridge up Vauxhall Bridge Road. There's a possibility that might change: "The Cycling Commissioner has commented on the design of both new and existing Cycle Superhighways. Specifically, comments have been made regarding the proposed design of CS Route 5 to make improvements – mainly relating to the section between Oval and Victoria, where an alternative route is proposed off Vauxhall Bridge Road and additional segregated cycle lanes are proposed on Vauxhall Bridge and around Vauxhall gyratory". Sounds extremely sensible to me given the fact the design for this stretch was relatively compromised in order to fit bikes, cars, buses and vans in relatively narrow lanes. At Oval junction, it is also now confirmed there will be mandatory cycle lanes on Camberwell New Road. "Cycle Superhighways need to be considered within the context of the overall cycling and traffic management portfolio. While incremental quantified business cases for cycling may be finely balanced in the short-term, the aggregate cycling infrastructure and behaviour change projects proposed within the new TfL Business Plan will contribute to the overall five per cent modal share target – with a likely ‘tipping point’ between now and 2026 where the aggregate benefits start to outweigh negative impacts on other modes." In shorthand: investment in cycling projects takes time to deliver bang for your buck. But, over time, investment in cycling delivers more benefits to more people wanting to travel around London than disbenefits. What's even more significant is that the report also makes a tacit admission that funding for cycling has traditionally been hard to obtain because the business cases used by Transport for London have not measured the benefits to all Londoners that come from investment in cycling infrastructure. This is very important stuff: "TfL's business case analysis tools are not generally well set-up to quantify the benefits of cycling projects", says the document. This is what you get when you do the maths properly. 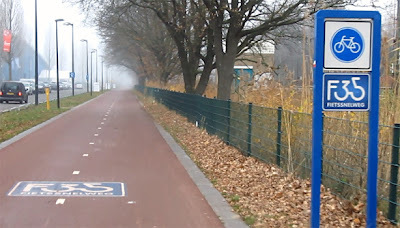 New High Speed Cycle Route in the Netherlands. This is really important because it implies that TfL may have justified not investing in cycling until now in part thanks to a flawed business case methodology. I am 100% sure that the same could be said of councils and highway agencies all across the country. They measure benefits and disbenefits, see that a few motorists will be inconvenienced in the short term and then decide cycling isn't worth the investment. But TfL is telling us, publicly, that those measures of benefits and disbenefits don't count cycling properly. And, moreover, that having more people cycling benefits more people more often over time than not investing in cycling. This is a crucial admission because it paves the way for investment in cycling to be measured properly and for funding to therefore be applied properly as well. This sort of business model thinking has been the norm for decades in countries like Denmark and the Netherlands. In both of these countries, they invest in cycling because it makes economic sense. And it makes economic sense because they account for cycling properly: The Cycling Embassy of Denmark pointed out last year that the country "saves approximately £0.30 per cycled compared to per driven kilometre". If you base your business case on that sort of statistic, then investment in cycling flows just like any other transport investment, not as a sort of unloved last minute add-on. If, as in the UK until now, you base your business case on short term benefits and disbenefits that don't count cycling properly, you get virtually no investment in cycling. What you get when you do the maths properly is something that looks and feels very different to the UK, where we design our transport systems based on flawed business case models. In the Netherlands, one regional government is building the F-35 High-Speed Cycle Route. It is 37 miles long and runs parallel to the A35 motorway route. As I said earlier. Who could disagree with these ambitions? This isn't about 'cycling' any more. This is about sensible investment and sensible returns on those investments for the towns and regions that include cycling in their plans. Transport for London has just announced the first step in getting the UK to accept that cycling is about sensible investment that makes transport cheaper and more efficient for everyone. I wonder when the same change in thinking will be applied to cycle training?